This article is about the city in Ohio. For other uses, see Athens (disambiguation). Athens is a city in and the county seat of Athens County, Ohio, United States. It is located along the Hocking River in the southeastern part of Ohio. A historic college town, Athens is home to Ohio University (26,000+ students) and is the principal city of the Athens, Ohio Micropolitan Statistical Area. The official population of Athens in the 2010 U.S. Census was 23,832. Athens is a qualified Tree City USA as recognized by the National Arbor Day Foundation. Athens is located in what was once the eastern region of two major Native American mound-building groups, the Adena culture from c. 1000 BC to 200 AD and the Ohio Hopewell tradition, c. 300 BC to 700 AD. By the middle of the eighteenth century, the Shawnee, an Algonquian tribe, were the primary tribe of Native Americans living in what would become Athens County. According to a 1794 map by Thomas Kitchin, no settlement existed in the Athens area during the time immediately prior to the founding of the city. The first permanent European settlers arrived in Athens in 1797, more than a decade after the United States victory in the American Revolutionary War. In 1800, the town site was first surveyed and plotted, but it was not incorporated as a village until 1811. In the meantime, Ohio had become a state in 1803. Ohio University was chartered in 1804, the first public institution of higher learning in the Northwest Territory. 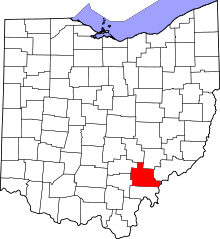 Previously part of Washington County, Ohio, Athens County was formed in 1805, named for the ancient center of learning, Athens, Greece. 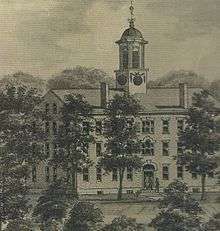 Ohio University in Athens was established with the first federal endowment of an educational institution in the United States. In July 1787, the Congress of the Confederation gave to the Ohio Company of Associates "two townships of good land for the support of a literary institution" in the newly created Northwest Territory. During The First Session of the Second Territorial General Assembly, held in Chillicothe from November 23, 1801 to January 23, 1802, the General Assembly passed an act establishing the "American Western University" at Athens. The act was approved by Arthur St. Clair, Governor of the Northwest Territory on January 9, 1802. However, no university with the name of American Western University would be established. Ohio became a state in 1803 and on February 18, 1804, the state legislature passed an act establishing the "Ohio University" in the town of Athens. Athens received city status in 1912, following the 1910 census showing the population had passed 5,000 residents, the requirement for city status in Ohio. Originally, large tracts of land in Athens and Alexander Townships were set aside through a contract between the Congress (under the Articles of Confederation) and the Ohio Company of Associates, a group of American Revolutionary War veterans. These lands were given to Ohio University by the Federal government. This was the first federal land grant for a university, pre-dating the Morrill Act by more than 70 years. At first, lands were mostly leased out, but the failure of many lessors to pay their rents resulted in most of the land being sold. The sale of these lands funded the growth of Ohio University. Today it is one of the largest institutions of higher learning in Ohio, with an enrollment of over 19,000 on the Athens campus and over 28,000 for all campuses. The earliest industry in the area was salt production, followed by iron production and coal extraction. Today, the largest employer in the county is Ohio University. In 1843, the Hocking Canal opened, enabling shipping from the Ohio River up the Hocking River, which passes through Athens, to Nelsonville, Ohio, and points beyond. However, the canal was closed during cold winters when it froze over. The first railroad reached Athens in 1857. In the late 19th century, an interurban line opened between Athens and Nelsonville and operated for some years. The Athens Lunatic Asylum, then called the Athens State Hospital, opened in 1874. This was located on high ground to the south of town and to the south of the Hocking River. In the late 19th century the hospital was the town's largest employer. The state hospital was eventually decommissioned and the property was deeded to Ohio University. It is now known as The Ridges. Much of the building space has been renovated for offices and research space, and most of the grounds have been set aside as open space, including a land lab. In 1904 the U. S. Army and the Ohio National Guard conducted joint training exercises near the city. Multiple US army regulars became drunk and were arrested by National Guard Provosts for causing disturbances. The arrests angered the regulars; on Friday a large contingent set out from camp to free an arrested comrade. The armed regulars were stopped by provosts and the ensuing quarrel quickly escalated into a shoot-out on Washington Street, during which one guardsman was killed and five others were wounded. The University and in turn the City saw large growth during the post-World War Two era and again during the Vietnam War era. Growth slowed in the 1980s with small increases in growth into present times. Athens is located in the unglaciated Allegheny Plateau. Athens is surrounded by hills that rise about three hundred feet from river valley to the narrow ridge tops. The county extends west from the Ohio River, mostly centered around the lower Hocking River watershed. According to the 2010 census, the city has a total area of 10.05 square miles (26.0 km2), of which 9.83 square miles (25.5 km2) (or 97.81%) is land and 0.22 square miles (0.57 km2) (or 2.19%) is water. Large sections of Athens and Ohio University are located in the floodplain of the Hocking River. Over the last two centuries the town suffered from many destructive floods, including notable floods in 1832, 1873, 1907, 1937, 1949, 1964 and 1968. In 1969 the Army Corps of Engineers completed a major work that rerouted and expanded the channel of the Hocking River, for a stretch of several miles around the town, moving the river hundreds of feet to the south. That project and the ongoing efforts to maintain the channel have greatly reduced the negative effects of seasonally high river levels. Athens is located mostly on and around a south-jutting ridge bordered by a loop in the Hocking River. The underlying geology is mostly sandstone and shale, including "redbed" shale that presents a severe slip hazard when structures are built over it on hillsides. However, there are safe zones above sandstone beds, most notably the Connelsville Sandstone that outcrops high on the hillsides. The old Athens Mental Hospital grounds (now part of the university) was built on the top of a hillside in the late 1860s, and is completely stable due to its position atop the hill rather than on a slope. The recent University Courtyard Apartments is also built on similar underlying geology across a small valley, but the hilltop was extensively removed in order to create a stable base. The city receives all its water supply from wells in unconsolidated river aquifers, and is reputed to be the largest city in the United States to do so. As of the census of 2010, there were 23,832 people, 6,903 households, and 1,842 families residing in the city. The population density was 2,424.4 inhabitants per square mile (936.1/km2). There were 7,391 housing units at an average density of 751.9 per square mile (290.3/km2). The racial makeup of the city was 86.4% White, 4.4% African American, 0.2% Native American, 6.1% Asian, 0.6% from other races, and 2.3% from two or more races. Hispanic or Latino of any race were 2.4% of the population. There were 6,903 households of which 11.8% had children under the age of 18 living with them, 20.5% were married couples living together, 4.2% had a female householder with no husband present, 2.1% had a male householder with no wife present, and 73.3% were non-families. 33.8% of all households were made up of individuals and 5% had someone living alone who was 65 years of age or older. The average household size was 2.28 and the average family size was 2.74. The median age in the city was 21.6 years. 5.8% of residents were under the age of 18; 67.6% were between the ages of 18 and 24; 14.4% were from 25 to 44; 7.9% were from 45 to 64; and 4.3% were 65 years of age or older. The gender makeup of the city was 50.0% male and 50.0% female. As of the census of 2000, there were 21,342 people, 6,271 households, and 1,906 families residing in the city. The population density was 2,560.4 people per square mile (988.0/km²). There were 6,715 housing units at an average density of 805.6 per square mile (310.9/km²). The racial makeup of the city was 89.16% White, 3.82% Black or African American, 0.15% Native American, 4.47% Asian, 0.06% Pacific Islander, 0.60% from other races, and 1.74% from two or more races. Hispanic or Latino of any race were 1.41% of the population. There were 6,271 households out of which 12.9% had children under the age of 18 living with them, 22.9% were married couples living together, 5.6% had a female householder with no husband present, and 69.6% were non-families. 34.5% of all households were made up of individuals and 6.6% had someone living alone who was 65 years of age or older. The average household size was 2.25 and the average family size was 2.72. In the city the population was spread out with 6.7% under the age of 18, 66.7% from 18 to 24, 13.7% from 25 to 44, 8.0% from 45 to 64, and 4.9% who were 65 years of age or older. The median age was 22 years. For every 100 females there were 88.2 males. For every 100 females age 18 and over, there were 86.9 males. The median income for a household in the city was $17,122, and the median income for a family was $53,391. Males had a median income of $35,849 versus $28,866 for females. The per capita income for the city was $11,061. About 14.8% of families and 51.9% of the population were below the poverty line, including 19.1% of those under age 18 and 7.2% of those age 65 or over. The City of Athens has always been known as a 'college town,' but from the mid-1800s until the 1950s, coal & brick-making was a major source of employment in the county. Today they are a very minor source, as the best and most available coal has been extracted, and cheaper brick-making is available outside the area. One of the manufacturing companies that once existed in the City of Athens was the Midget Motors Corporation, makers of the small automobile, the King Midget. Ohio University is now the largest employer in Athens County. In addition to direct employment through the University, much of the local economy depends on tourism and events related to the University, through local restaurants, bars, stores and hotels. Athens also houses a small array of manufacturing and technology related businesses, including Quidel Corporation (formerly Diagnostic Hybrids), Stewart-MacDonald, Sunpower, Fastenall, and Gorman-Redlich. Since the 1970s Athens has earned a reputation as one of the more progressive (liberal) communities in Southeastern Ohio. That reputation includes democratic political leaning, presence of some international communities, support for use of alternative energy, calling for 'smart growth' development, development of small farms emphasizing sustainable and organic-produced crops, and support for local businesses. Many of these attributes are illustrated at the Athens Farmers Market, currently open year-round on Saturdays and Wednesdays at The Market on State on the city's east side. Court Street and several cross streets are the heart of the uptown with a number of small shops, banks, offices and many national/local restaurants, coffee shops, bars, clubs and a movie theater. This area has a number of small to large student apartment buildings. Court Street is the home of many events during the year and is very lively place until late at night. Ohio University's main 'college green' entrance is located at Court & Union. With its student center (John Calhoun Baker University Center) is at one end of Court Street. Outside of the uptown area, Athens shopping areas located; the largest on East State Street with a small mall, several shopping strip centers, plus large box stores, car dealerships, hotels/motels and many local and national sit-down / fast food restaurants. On the north side of town is Columbus Road area with some shopping, car dealer, motels, eateries and office buildings. On the south side, Richland Ave. area is many large student housing apartment complexes and several fast food restaurants, shops, and a large full-service hotel. West Union St. has some restaurants, offices, the hospital complex, some student housing and the county fairgrounds. A large fire in Nov. 2014 damaged or destroyed six buildings on West Union (near Court St). The buildings housed businesses and upper floor student apartments, no one was hurt in the fire with one business reopened for business in early 2015 and rebuilding on the sites started in the summer of 2015. Athens has a long musical tradition that includes local acts and events for touring musicians, performing at Ohio University and festivals in Athens. The folk song "Athens County" - words by Joe Dolce; music by Jonathan Edwards - refers to Athens, Ohio, where Edwards & Dolce attended college in the late 60s. Edwards went on to have a Number 2 hit song nationally with 'Sunshine' while Dolce moved to Australia and had an international Number 1 hit with Shaddap You Face. Dolce is now an established poet and essayist in Mebourne. Bands hailing from Athens include The Headstone Circus, The Snapdragons, Appalachian Death Ride, She Bears, Southeast Engine, The Ridges and the metal band Skeletonwitch. Athens native Steve Reis, a founder of the Columbus, Ohio-based band McGuffey Lane named his band after a street in Athens. In 1973, the Ohio Valley Summer Theater began a production called the Appalachian Green Parks Project. It featured music, dance, and theater derived from the Appalachian region. The group won the Governor's Award for Community Action, released an album of music, performed at the Sylvan Amphitheater in Washington, D.C. on July 4, 1974, made numerous television appearances, provided the soundtrack for an Ohio Department Of Natural Resources public service film titled Sweet Ohio, were designated as the official Bicentennial Touring Group for the state of Ohio, and were the subject of a documentary film during their four-year run. Two former members of the Appalachian Green Parks Project, Jim McGaw and Charlie Lewis began performing with Jimmy Prouty and went on to form the New Vinton County Frogwhompers Marching, Singing, Strumming and Plucking Society in 1976, which was to become one of the most popular groups to come out of the region in the 1970s. A University park on Richland Ave was designed by Athens' own Maya Lin. Athens is home to the annual Halloween Block Party, a massive international spectacle that draws attention from news media across the world each year. Ohio University's citation as the world's most haunted institution of higher education by the British Psychical Institute; Athen's citation as one of the 10 most haunted American cities; and the annual Halloween celebration, have dually added to Athens' reputation as one of the 10 most terrifying places on Earth and the “The World Capital of Halloween.” Athens was vaunted as one of the top fifteen most haunted cities in America on the Fox Family Channel special "Scariest Places On Earth" that aired on October 23, 2000. Locals with knowledge of the history of The Ridges criticized the Fox portrayal as sensationalistic and misleading on details of the situation. The block party has welcomed more guests each year, and festivities and security have grown in it for that reason. The event caters to roughly 20,000 to 30,000 dressed up partygoers on four closed blocks of uptown streets. It is touted to be the third largest block party in the nation. The Dairy Barn Arts Center: Contemporary arts and crafts. Kennedy Museum of Art at Ohio University: Major collections include Southwest Native American textiles and jewelry. Contemporary prints. Ohio Valley Museum of Discovery: Interactive children's center. Blackout Fest is held annually at The Union and features many up-and-coming national underground rock acts. The Athens Community Music Festival is held each August and features dozens of local bands. The Ohio Brew Week has been held every year in Athens since 2006. It features the best of Ohio craft brews, a homebrew competition, and a wide variety of scheduled events. The Hockhocking Folk Festival is held annually in May at Hocking College. Ark Fest and other student-organized festivals. The Athens Area Sustainability Festival is held annually at the beginning of October at the Athens Fairgrounds; it began in 2001. The Pawpaw Festival has been held annually since 1999 in September at Lake Snowden just southwest of Athens, near Albany. The annual Boogie on the Bricks is a fast-growing, all-day event held in July. For many years, an annual Springfest was held on the OU Campus. Primarily due to changes in state alcohol laws, it was replaced by an annual event at Ervin's Big Red Barn (and field), a private "party-farm" just outside the city. After the move, the festival was called Derby days. The organization who coordinated the event was removed from campus in 2003. Starting in 2004, Ohio University Seniors Dominic Petrozzi and Timothy Kehoe created One Fest. The festival name is changed each year to represent the number of years it has been held (for example, 2011 was 8Fest). As of 9 Fest, the event has been held at its new location on West Union St, just outside the campus. It has become one of the largest independent collegiate music festivals in the country, boasting previous performances by national recording artists such as Mike Posner, Machine Gun Kelly, Timeflies, Chip Tha Ripper, Wiz Khalifa, Kendrick Lamar, Steve Aoki and more. in 2008, the name of the festival was changed to "The Number Fest" with an updated "edition" for each year it takes place. Number Fest - 14th Edition will be held on April 16, 2016. Palmerfest and other street parties attended by mainly university students. Lobsterfest is an annual free concert hosted by the university's All Campus Radio Network. Ohio University sponsors an annual Literary Festival every spring. The three-day festival began in 1986 and includes lectures and readings by visiting authors. Recent guests: Billy Collins, Amy Hempel, Marilynne Robinson, George Saunders, and Tobias Wolff. Since 1983, the 970WATH-Power 105 Chili Bowl has been an annual event and each year raises money for a charity. Currently it takes place in October, at The Market on State. Hookah in the hills, an annual festival held twice a year at Poston Lake Music Park in the Spring and Fall, featuring the Columbus-based band Ekoostik Hookah, as well as other local bands. The annual Athens International Film and Video Festival is one of the few festivals that are on the official list of Academy Award-qualifying festivals. Local, regional to national bands (groups) perform in up-town bars, clubs, coffee houses or in performing centers in the Athens area. Ohio University provides intercollegiate athletics, including Ohio Bobcats football, men's basketball, and women's volleyball. The 2010 Sporting News list of the "best sports cities" ranked Athens 98 out of 402 eligible cities, putting it ahead of much larger cities such as Norfolk, Virginia; El Paso, Texas; Spokane, Washington; and Fresno, California. In addition to Ohio Bobcats athletics, Athens is home to the Southern Ohio Copperheads, a baseball team of the Great Lakes Summer Collegiate League. Athens City Schools fields teams at the Middle School (7th & 8th grades) and at Athens High School as the 'Green & Gold' Bulldogs with over 14 male/female teams offered. Athens recreation facilities include a community recreation center, several city parks and play grounds, public gardens, soccer fields, an arts center called Arts West, two off-leash enclosed dog parks, and an extensive scenic trail system in the city lands, adjacent Strouds Run State Park, and the Blair Preserve owned by the Athens Conservancy. The Athens Skate Park is the second largest skate park in Ohio. The City of Athens Ohio Community Recreation center offers programming in athletics, childcare, sports camps, community events and more. Located in the East State Street area, the center is accessible from the Hockhocking Adena Bikeway. Recreation facilities include an outdoor swimming pool, a skate park, fitness equipment, an indoor walking and running track, event rental facilities, and playgrounds. The Arts, Parks and Recreation Department actively supports a variety of community recreation initiatives. It sponsors adult summer and fall slow-pitch softball that is popular among residents in Athens and the county. The recreation department has organized men's, women's, and co-ed leagues, although the co-ed leagues have seen strongest participation in recent years. Soccer leagues are organized year round, with programs offered through the Community Recreation Center, Ohio University and the Athens Soccer Academy. Youth sports, such as soccer leagues, summer camps and little league, are also supported by local residents. Programming for the arts are facilitated through Arts West, the Dairy Barn, and Ohio University. Strouds Run State Park is located just outside the city, bordering the city line. This park features 2,606 acres (10.55 km2) of wooded hills, including many bluffs and rock shelters, centered around a man-made lake. Camping is available. The City of Athens has recently established the Strouds Ridge Preserve project, currently including some 345 acres (140 ha), to save land from development adjacent to the state park. This preserve includes an 85-acre (340,000 m²) old-growth forest known as "Hawk Woods", or, more formally, the Dale & Jacki Riddle State Nature Preserve. Also adjacent to the state park is the 75-acre (300,000 m2) Blair Preserve, owned by the Athens Conservancy. The Hockhocking Adena Bikeway is a multi-use asphalt trail with its main hub (mile marker 0) at the Athens Community Center on East State Street. The trail extends 16.4 miles (26.4 km) northwest to Robbins' Crossing and Hocking College in Nelsonville and on to the Rocky Brands complex near the Public Square, and approximately 1.5 miles (2.4 km) further east along East State Street to Holzer Clinic. Construction currently underway will extend the trail farther in this direction. Access points with parking are located at mile 4 at the West State Street Park, mile 10.2 off Rt. 682 in The Plains, and mile 16.4 at Robbins' Crossing and Hocking College. The trail, which generally follows the course of the Hocking River, provides access to the East State Street commercial areas, Ohio University's campus (at South Green and Peden Stadium), The Plains, and Hocking College. It is designed for walking, running, biking, cross-country skiing, skating, and wheelchairs. Additionally several city streets are marked as bike lanes. The Athens Trail Network is a multi-use trail network branching out from Sells' City Park at the end of Avon Place. A series of twelve trails and connectors branch out into the surrounding woods, heading eastwards to eventually connect with the trails of Strouds Run State Park. The trails are designed for hiking, running, and biking, although some sections are off-limits to bicycles. The trails provide scenic views of the East State Street commercial area and travel past and through notable features such as Sells Pond, Riddle State Nature Preserve (also known as Hawk Woods), Boulder Cove, Turtlehead Cave (also known as Blue Ash Rockhouse), Finger Rock, Pioneer Cemetery, and Dow Lake at Strouds Run State Park. The trail network is maintained by community and university volunteers. Athens is governed by a mayoral-council form of government. The elected Mayor and the department chiefs run the city's daily operations. Nine city council members are the urban legislators. The city is divided into wards and voters select a mayor, a council member representing their ward and three at-large council members in staggered four-year terms. City Hall is located in uptown on Washington Street. Athens is also covered by the Athens County Department of Health, the Athens County Planning Office, and Athens County Job and Family Services. The city of Athens has a strict parking policy. Any vehicle parked for more than 48 hours on any city street will be taken by city order, and is subject to a minimum $145 redemption cost ($125 towing plus $20 ticket). The city has a professional Police Department since 1911 working 24/7 year round. Today the force is made up of about 30 Officers plus a like number of reserve officers and support staff. Ohio University also has a police force with about 25 officers. Each of these departments work well together and support each other. Both have additional help when needed by the county sheriff department. Athens Fire department founded in 1830 and became full-time in the 1930s has two stations, a staff of about 30. They work 24 on 48 hours off. The department not only covers the cities fire department needs but also that of Ohio University. The City is part of the county-wide Enhanced 911 system. This system is able to locate landline or registered cell phone users, and send a text or phone call message of alert to those who sign up. The city has a large number of rental homes/apartments which are inspected by the Housing Code Office. The city of Athens is the county seat making it the home of many county government offices and the county courthouse at the corner of Court and Washington streets. Each of Athens County's three commissioners are usually from the city of Athens. Athens is a stronghold of the Democratic Party. President Barack Obama visited the city and Ohio University late during the 2012 re-election campaign. The city and Athens County have voted Democratic during all presidential elections since 1976. Ohio University is a public university located in Athens (22,000+ students) that is situated on an 1,800-acre (7.3 km2) campus. Founded in 1804, it is the oldest university in Ohio, oldest in the Northwest Territory, and ninth oldest public university in the United States. OU moved to a semester system at the start of 2012-2013 school year, which now runs from late August to very early May of each year plus summer sessions. In its 2010 edition, U.S. News & World Report ranked the university's undergraduate program 115th among national universities. Outside of Ohio University, the residents of Athens are served by the Athens City School District, founded in the late 1840s, made up of five elementary buildings: Pre-K (Chauncey), K-6 (East, Morrison-Gordon, The Plains & West), a Middle School (grades 7-8) and Athens High School home of the 'Bulldogs'. 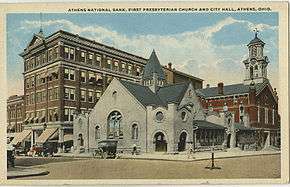 The city also served by the Athens County Public Libraries with branches in Athens, Albany, Chauncey, Coolville, Glouster, Nelsonville, and The Plains. The Athens Messenger, a daily newspaper published since 1848. The Athens Musician Network, a website founded in 1997 dedicated to archiving and promoting Athens' rich musical heritage. Site contains audio, video, venue information, musician blogs and more. It was not that long ago an uptown T-shirt shop had a top selling shirt that read, "Athens Ohio - it is not the end of the earth, But you can see it." Athens was not an easy place to get to. Railroad came to the city in the 1850s, with the last passenger train ending in the early 1980s. That left a few freight trains passing near the city. The first 4-lane road into and out of the city came in the early 1970s. SR 32 from Athens to Cincinnati was completed in the early 80's. Four lanes from Athens to Belpre/Parkersburg was completed in the late 1990s on US-50, SR-32 & 7 hooking up with I-77. In the early 2000s, SR-33 'Super-2' highway was complete, linking Athens to I-77 at Ravenswood, WVa. In October 2013, the last section of the 4-lane highway was completed, bypassing Nelsonville's two lane road on SR-33, linking Athens with Columbus. Ohio University has a small but modern airport (5600 ft long runway) about 15 miles southwest of the city near Albany off US-50/SR-32 called Gordon K. Bush Airport. The city is famous for parking issues, so Athens has a public bus system which has several routes inside the city and one to The Plains. OU has a small student campus bus system that links with a city bus system. Many student apartment complexes have their own bus shuttle. Athens also has an inter-city bus line from Athens to Columbus, Cincinnati and Marietta, running twice a day with stops in-between. At Ohio University the Heritage College of Osteopathic Medicine was established in 1975. It is currently the only osteopathic medical school in the state and offers the degree Doctor of Osteopathic Medicine (D.O.). The college is accredited by the American Osteopathic Association. In 1993, Barbara Ross-Lee, D.O., was appointed to the position of dean of the Heritage College of Osteopathic Medicine; she was the first African-American woman to serve as the dean of a U.S. medical school. The College has about 500 students enrolled. The school offers University Medical Associates founded in 2003 which is a wide-ranging service in multiple locations around the Athens area. UMA's mission is to deliver health care services to the residents of southeastern Ohio while providing clinical training opportunities for future osteopathic physicians. "Campus Care" is an on-campus clinic for students and staff. Additionally, Athens is served by OhioHealth O'Bleness Memorial Hospital a 140+ bed non-profit community hospital founded in the early 1920s as Sheltering Arms Hospital. O'Bleness, built in the early 1970s, overlooks the Hocking River and is near the University campus. O'Bleness emergency department (as well as the lab & radiology) is open 24/7 365 days at year. The hospital has a helipad located near the ED. On the hospital grounds is the Cornwell Center, which houses a catheterization lab, cardiac/pulmonary rehabilitation program as well as medical offices. The Castrop Center houses Athens Cancer Center, medical offices plus a public pharmacy. O'Bleness was in a management agreement with OhioHealth from 2010 until early 2014 when O'Bleness became a whole part of the OhioHealth system. The Tri-County Mental Health Services complex is also next door to the west of the hospital. On the east side of the Athens there is Holzer Clinic part of Holzer Medical group of Gallipolis, Ohio. This two-story complex has an Urgent Care unit, Outpatient services unit, with many offices & specialists. Plus the clinic has a heliport. Maya Lin, architect and designer of the Vietnam Veterans Memorial. ↑ "US Gazetteer files 2010". United States Census Bureau. Archived from the original on 2012-01-24. Retrieved 2013-01-06. 1 2 gov/faces/nav/jsf/pages/index. xhtml "American FactFinder" Check |url= value (help). United States Census Bureau. Retrieved 2013-01-06. 1 2 3 "American FactFinder". United States Census Bureau. Archived from the original on 2013-09-11. Retrieved 2008-01-31. ↑ "Athens County Profile - Ohio County Profiles - Ohio Department of Development - Office of Policy, Research and Planning" (PDF). ↑ "Tree Cities Around the Nation, " . " Arbor Day Foundation, accessed 28 July 2008. ↑ Mensonge, Joseph (2004). Early Inhabitants of the Ohio Valley. Athens, Ohio: Ohio University Press. ↑ The Biographical Annals of Ohio, 1906-1907-1908: A Handbook of the Government and Institutions of the State. Compiled Under the Authority of the Act of April 19, 1904 by A. P. Sandles, Clerk of the Senate, E. W. Doty, Clerk House of Representatives, 77th General Assembly. A revised and enlarged edition of Ohio Statesmen and Hundred Year Book by Col. W. A. Taylor (1892). ↑ "War on the Streets of Athens". The Athens Messenger. 25 August 1905. ↑ Moore, Cyrus (October 16, 2011). "The Battle of Athens". Conversations from Studio B (Interview). Interview with Ron Luce. Athens, Ohio: WOUB-FM. ↑ "2010 Census U.S. Gazetteer Files for Places – Ohio". United States Census. Archived from the original on 2016-07-02. Retrieved 2012-10-19. 1 2 Straw, Richard. "Images of America: Athens" Arcadia Publishing. 2007. ↑ "Incorporated Places and Minor Civil Divisions Datasets: Subcounty Population Estimates: April 1, 2010 to July 1, 2012". U.S. Census Bureau. Archived from the original on 17 June 2013. Retrieved 25 November 2013. ↑ "See how the new Diagnostic Hybrids brand looks now". ↑ "Dave Scholl: Athens-grown PhD turned CEO". Businessremixed.com. Retrieved 2013-07-09. ↑ "Stewart-MacDonald: Living the Luthier Legacy". Businessremixed.com. Retrieved 2013-07-10. ↑ "Appalachian Death Ride Home Page". Escapistart.com. Retrieved 2013-03-30. ↑ Un. "SKELETONWITCH | Gratis muziek, tourneedata, foto's, video's". Myspace.com. Retrieved 2013-03-30. ↑ "America's 10 most haunted cities". USA Today. 24 October 2012. Retrieved 10 October 2014. ↑ "10 most haunted places on Earth". Listverse. 7 July 2010. Retrieved 10 October 2014. ↑ Evans, Chris. "Fox ghost story more of a fish story. " The Post. Wednesday, 25 October 2000. Accessed April 20, 2010. ↑ Hockhocking Adena Bikeway. Trail Link. 2007. Accessed 28 July 2008. ↑ Athens Trail. Cycle Path. Accessed 28 July 2008. ↑ "Athens, OH - Official Website". Ci.athens.oh.us. 2013-02-27. Retrieved 2013-03-30. ↑ "Athens, OH - Official Website - Police Department". Ci.athens.oh.us. Retrieved 2013-03-30. ↑ "Athens, OH - Official Website - Fire Department". Ci.athens.oh.us. Retrieved 2013-03-30. ↑ "The Athens Messnger". The Athens Messenger. Retrieved August 25, 2012. ↑ "The Athens Messenger". Athens, Ohio: Ancestry.com. ↑ "FOSTER, Israel Moore, (1873 - 1950)". Biographical Directory of the United States Congress. Retrieved December 21, 2012.